Do you love emoji-based games? If so, check out the new game from EmojiPlus. Solve the Emoji also known as Emoji 2, is the new emoji-based trivia game that is taking over the charts! The new game is formatted like many of the other trivia games that are topping the charts. With over 900 levels, you will become an emoji-pro in no time! To begin each level, you will be given an image, blank spaces, and a letter bank. Look at the emoji icons and try to figure out what they are trying to say. Once you think you have it figured out, use the letters in the letter bank to form the word or saying. For example, you may be given a thumb down emoji and a four-leaf clover emoji. Use your creativity and imagination, coming up with the term, bad luck. If you are having trouble figuring out one of the emoji combinations, the game does offer two in-app hints. For 90 coins you can remove three out of the twenty-one letters in the bank. 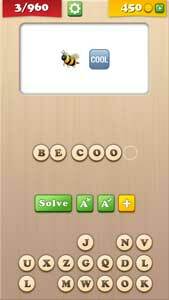 For 60 coins, you can reveal one of the letters in the answer. To earn coins, you must correctly answer the different levels. Coins may run out fast if you are constantly using them. Try to save your coins until you really need them. If you run out and don’t want to purchase more, check out all of the Solve the Emoji answers and cheats to help you keep playing! Next post Find The Emoji Is Freshest Emoji Game Yet!